Alfred M. Uhler, Concord Antiques Dealer and friend. 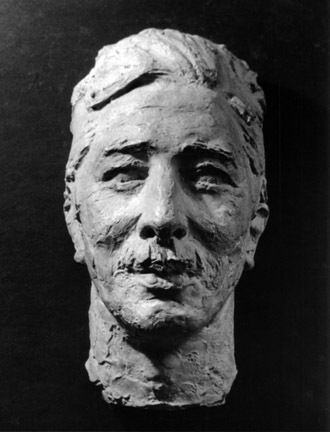 Portrait head, cast in plaster by Sculptor Frederick Warren Allen between 1925-1935. Found in the basement of Agnes Allen’s home, this portrait was of the Allen’s friend Alfred Uhler from Concord, MA. Al and his wife would come over to play cards in the evening with Fred and Agnes, so they enjoyed a pleasant friendship. Kathleen, who was a fine pianist, became more involved with the family as she taught the Allen daughters, Barbara and Margery, to play the piano. Agnes also played the piano, so they had that in common. Alfred had an aesthetic sensibility as a seller of Antiques and Old Books so he and Fred got along. He and Kathleen lived at the historic Thomas Dane House on Lexington Road near the Ralph Waldo Emerson house and they were only 1.5 miles away from the Allens at 387 Elm Street from 1925 until they relocated to California in 1934-35. Both couples had moved to Concord in the same year and both Fred and Alfred were born in 1888. They had interests in common, so formed a friendship that lasted at least nine years until the Uhlers moved to California. Barbara remembers that they had a recital at which she forgot her piece and, frightened, jumped up and ran out of the house! 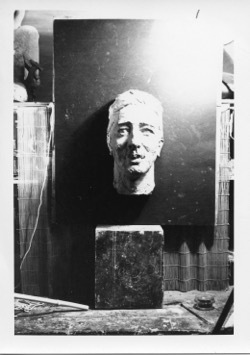 In talking with Barbara about what technique he might have used to create the bust, she remembers that her father always used his thumbs. He said to the children that you should put clay on with your thumb, and not with your fingers. She remembers seeing him pick up a little bit of clay and smear it on using his thumb. Seated across from Alfred at the card table, Fred had plenty of time to look at him, so he probably studied his face and made mental notes. It was an interesting face, full of personality. Whether his skin was as ruddy as it appears in the portrait is unknown, but Fred took the opportunity to use a more impressionistic technique in this portrayal. The roughness catches and reflects the light making the shadows deeper and the highlights brighter. Al’s features are strong, so they can withstand the more tactile handling of clay that takes advantage of that quality, leaving a rugged exterior appearance. His thick shock of finger-combed hair, bushy mustache and full eyebrows give the face strength when added to the generous facial features. It’s an interesting study, a character portrayal and a personal memory of a friend. Modeled in clay; cast in plaster and colored or sealed, evidenced by the brush and pot of color or ink beside the studio model. My great Aunt was Alfred M. Uhler’s second wife. She had a bust that may have been made from the clay model. When my Aunt died we gave the Bust to one of Alfred’s daughters in Massachusetts.